Have you ever had one of those days …forget it… weeks… where it appears that the handlebars that you use to control your life have broken off mid happy stride? You know the one. Things are going so well. The move went smoothly. I’ve gotten to re-connect with some amazing people and even managed to purge myself of some vices (ok people )that once I looked at them objectively I realized they may have burned out their time in my life. I was deftly shown that their place in my life and my choice to let them take that spot was truly a choice and frankly one that didn’t make a lot of sense so time to release them. I love knowing that I have real enough people in my life to tell me the truth of things like that and support me through all of the emotions that come with choices like that. May you all be that lucky. So here I am things going along better than I even expected. I am feeling brave and confident, downright successful and Boom – the bottom falls right out. I had one of those weeks this week. I started off my Tuesday finding out my largest client was laying me off that instant. Being an independent contractor, there is no such thing as unemployment. And I don’t really make enough to have that other thing that other people take for granted – savings. Suddenly my four weeks of triumph doesn’t feel so, well, triumphant. Instead, in an instant, it has become a source of panic and concern. I’ve recently told my tenant that I was getting a new tenant mid May so how will I pay the rent once he is gone? What if she decides that she doesn’t want to move in afterall? How will I manage to seam together all the bills that call my name even if I cut out all of the non-essentials? Once I eat everything in the pantry, how do I get the nutrition that is essential on a shoestring? I’m betting you all have had that moment you know all of the crazy things that enter your mind when panic is the one in the driver’s seat. The friend of darkness that happily sits down with you in the quicksand of worry? He not only encourages you to stay seated in it, he will happily dig a trench around you why you flap around in the panic. Then, he will take giant buckets of the sand he’s moved and happily dump them over you, taking no care to look after where it lands. If he hits your head and mind multiple times that’s a win for him, as you metaphorically tire out and often slip further from the spiritual center that connects us all with God and the hope and Light that He gives us.The darkness aims to make our minds so full with thoughts of sadness and trial that we cannot hear the successes that we have achieved in the midst of the trials that we are facing. In the midst of losing this client, I also managed to go and get my driving permit (without losing that client I might not have had the 5 hours it took to achieve this). This is monumental because this allows me access to practice the driving that will eventually give me the freedom to travel without using cabs or friends or having to coordinate schedules and feel like I imposing or that I am suddenly 10 years old and begging to go to soccer practice. I ALMOST MISSED IT. Without a lovely friend to remind me of the victory I would have allowed myself to be swallowed by the vortex of fear and sadness of the week. I would have seen all of the hours at the dmv and hoops as just another par for the course predictable crappy part of the week from heck. I would have missed the significance of the fact that I was able to hang on beyond the challenge and conquer the dmv and people’s bad attitudes to walk out with my golden ticket of sorts. Another illustration that He has my back even when I can’t see it. He wants the best for us even when we can’t see it or when we waste our energy arguing with Him about whether or not He really has a plan. (The answer — I promise that He does we have to chose to execute it. Remember the passage: The Lord helps those who helps themselves? True. ) He will help you remember the answers to the permit test that you haven’t studied for in like 10 years but you have to go to the DMV to do whatever is required and be willing to sit there long enough to be offered the test :). I’ll be honest, it’s easy to write an encouragement for you all when the sun is out, things are going right, and I feel brave and strong. It’s simply a bit of a transfer onto paper what courses through me. The irony is though, these darker challenging are the times that I need to write these entries most of all. See, the misnomer is that I write these as an encouragement solely for those around me. When people ask me, I’m quick to say that I am a vessel and I simply write what He says when He says to. And that is true, but I realize something as I type this today, this is for all of us — me included. As I go back and read the past entries once they has been posted, it is fun to go back and read them. Put a week between typing and posting and that comment is almost certainly true. So thank you for joining me on this journey. I hope that my openness and honesty helps at least one of you. You aren’t alone. The silence you hear isn’t really silent. There are prayers released around you all of the time for your success. There are words of encouragement spoken around you over and over. He hopes that we hear it as He connects with the spark He set in us ever so long ago. How we view what happens in our life is our choice. We have to learn to breathe through the moments of crisis. To still our minds and breathe through the crazy noise of fear — the what if’s and the voices that tell us that this is the moment that we fail. The moment that we break and run back to the life that He never meant us to have. A friend of mine recommended the book Unbeatable Mind by Mark Divine and it has some amazing breathing exercises that have helped me to calm myself and reconnect with the Light that I know is inside of me and each one of us. I’m just learning to do these breathing exercises so my focus doesn’t last as long as I’d like especially rattled by challenge recently, but they say practice makes perfect. It’s ok to be scared. 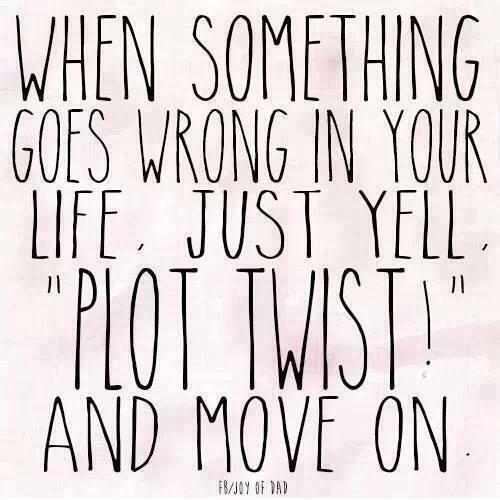 It’s ok to not see the plot twist coming. What matters is how we react to said plot twist. I know it’s hard, but continue to believe that He knows what He’s doing (see the entry about helicopter parade view called “I can’t see” if that seems impossible). Stand up out of the quicksand, tell that dark voice to shove it and scream”plot twist” at the top of your lungs. Have the resolve to do something that moves you on in your journey. In my case, I laid in my bed for an hour, ate a cookie, had a good cry and then I did something. I blasted out a bunch of resumes. I began to search my online work platform for a replacement client. Believe me, I know this is seemingly so much easier said than done. Even before sitting down to type this, I had to vanquish some thoughts of doubt and fear, and even typing now, I know that they will continue to appear throughout the rest of the week and probably until I am safely working at a new job and even then, the fears will switch but I also know that I must continue to make the choice to believe that He is in control. To believe there is a plan even when I am not holding it in my hands. And so I will. What do you say you join me? If that makes us crazy at least we will have company :).